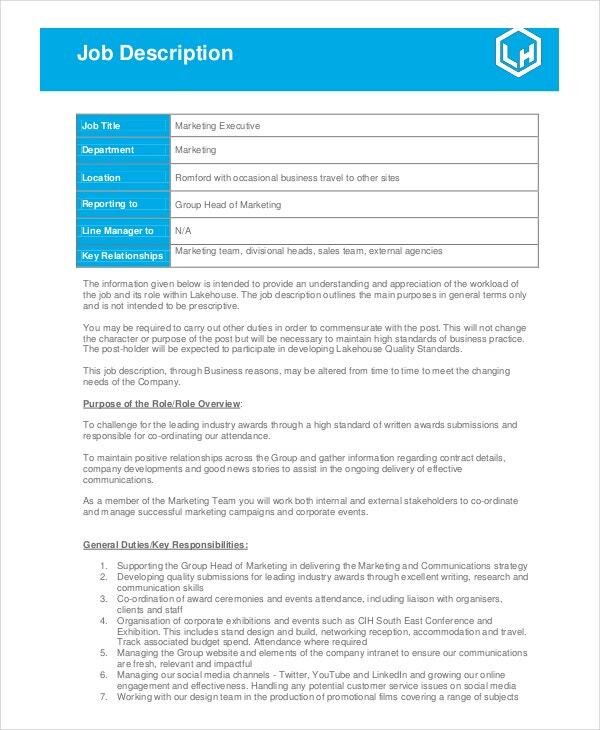 Companies use Marketing Job Description as a means for recruiting suitable candidates for different positions in their marketing team. 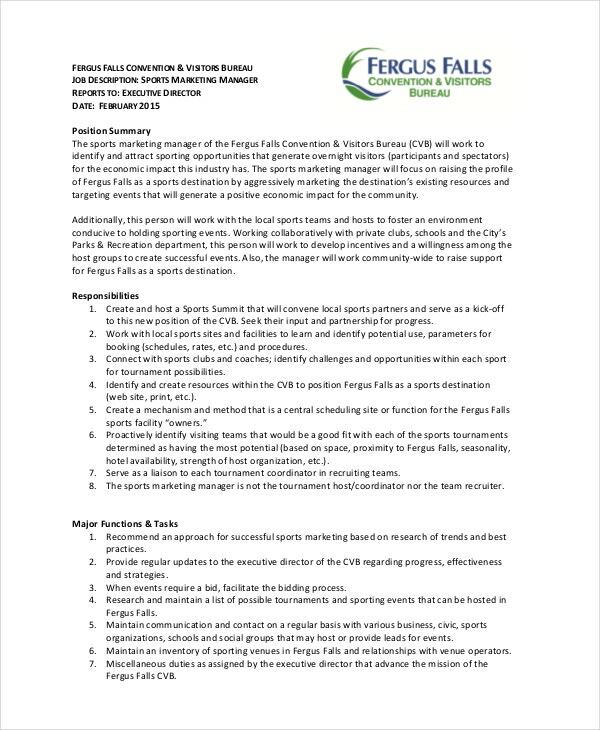 These job descriptions are intended towards candidates with a background in the study of commerce and having a sound knowledge in the area of marketing operations and ideas. 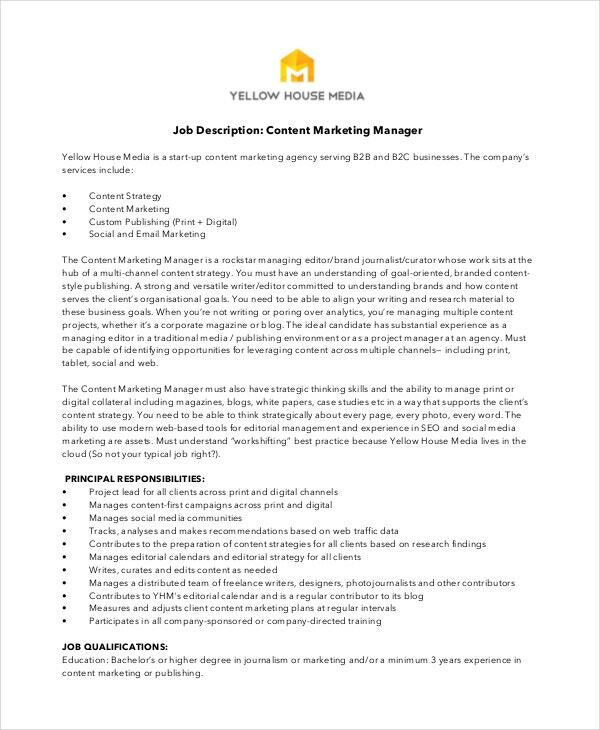 These Marketing Job Descriptions are immensely helpful for various companies as these enable them to find the right candidates for their marketing jobs. 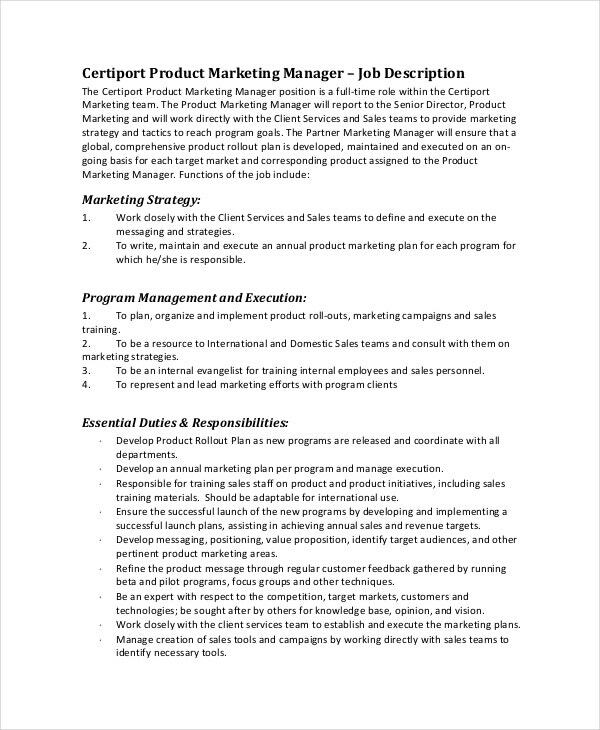 Given below is a list of marketing job description templates. A product marketing manager is someone who manages the operation of a firm that deals with goods and services. 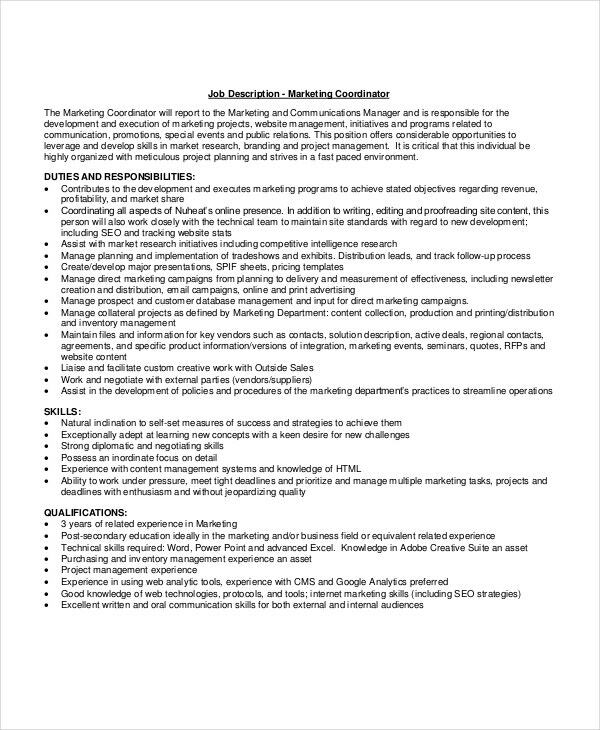 This job description gives a detailed description of the qualification, skills, and experience in marketing that the aspiring candidates must have. 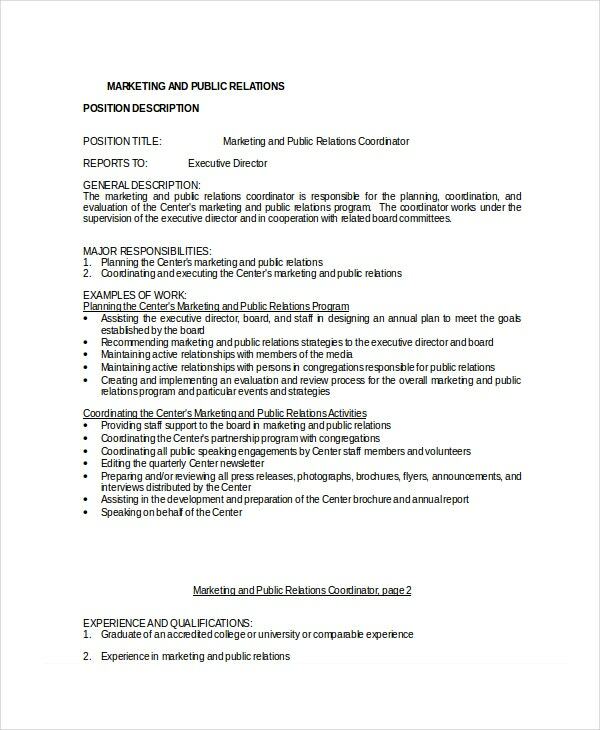 You can also check Marketing Coordinator Job Description templates. 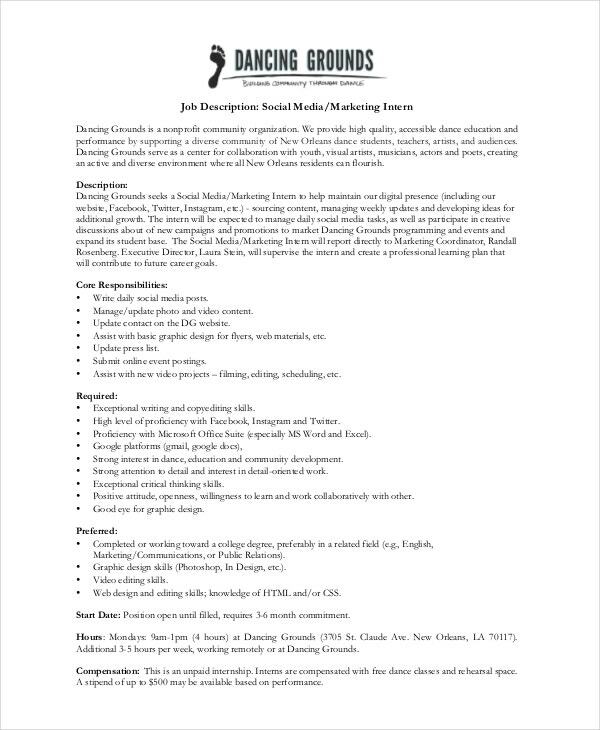 Social Media Marketing Job Description template describes the roles and responsibilities of a social media marketing manager. 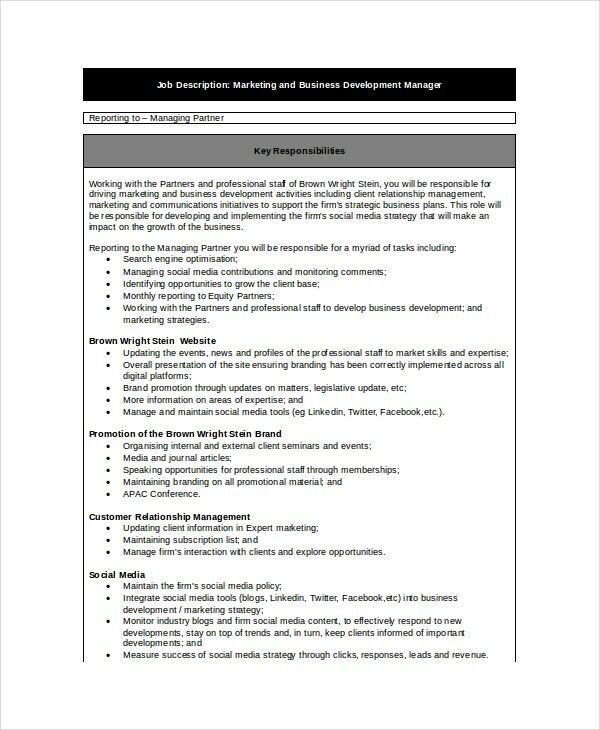 This template explains how a social media marketing manager should use his skills for the promotion of the firm and its products on social media platforms. 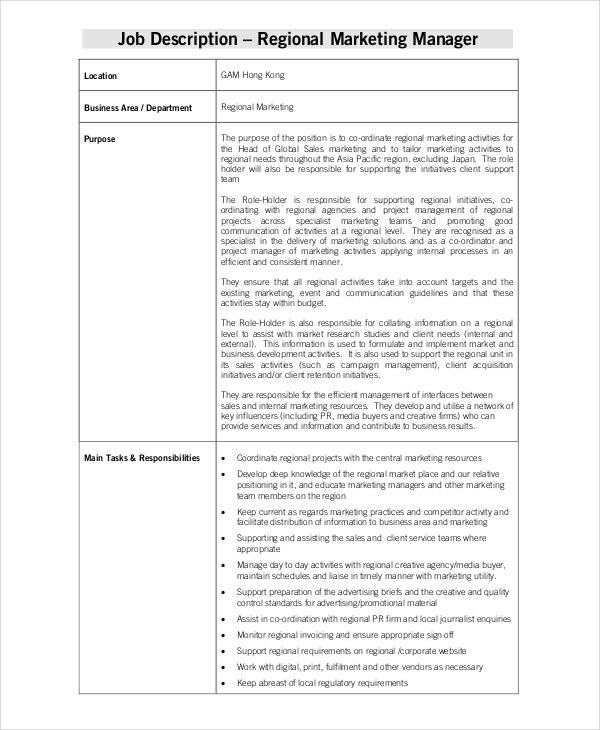 You can also check the Marketing Manager Job Description templates. 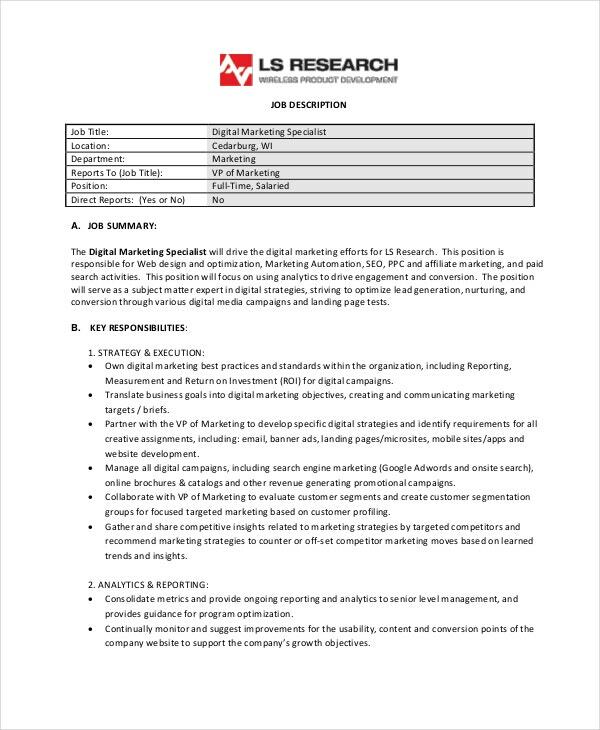 Digital Marketing Specialist Job Description offers information about the skills that the candidates need to possess on networking, effective use of the internet, e-commerce, and the process of digital marketing. 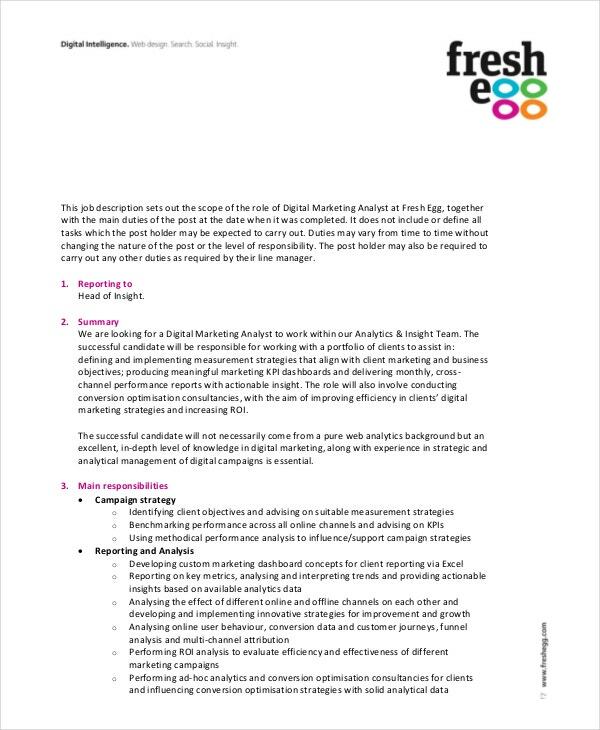 Digital Marketing Manager Job Description explain the roles and responsibilities that a digital marketing manager needs to perform. 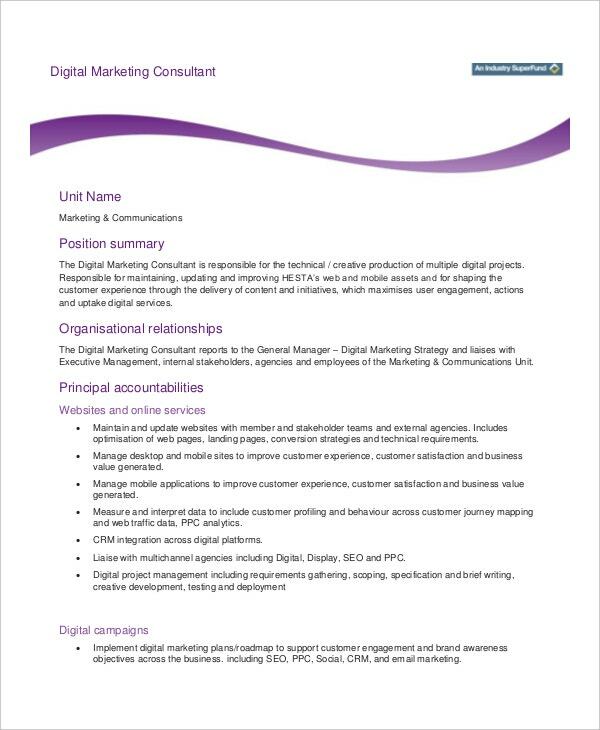 This job description highlights the roles that the marketing manager needs to play in developing and managing digital marketing campaigns and much more. 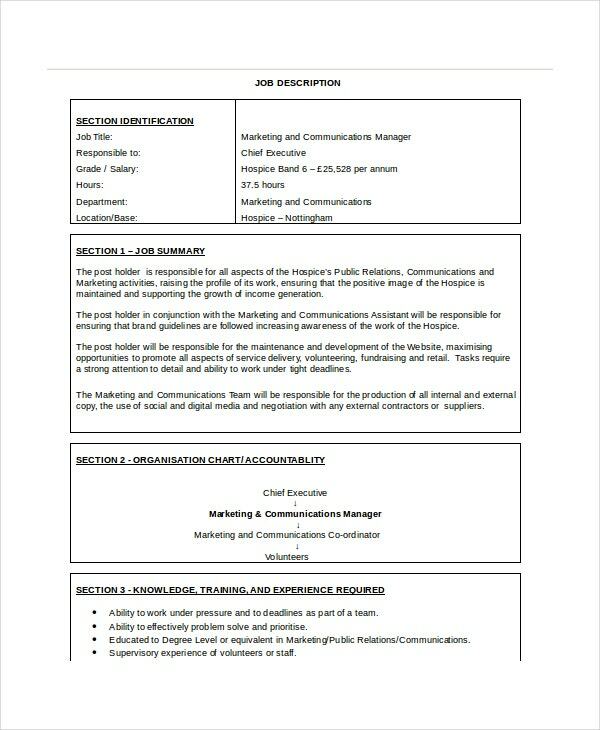 Marketing and Public Relations Coordinator Job Description gives a proper insight into the various roles that a marketing and public relation coordinator is required to perform. 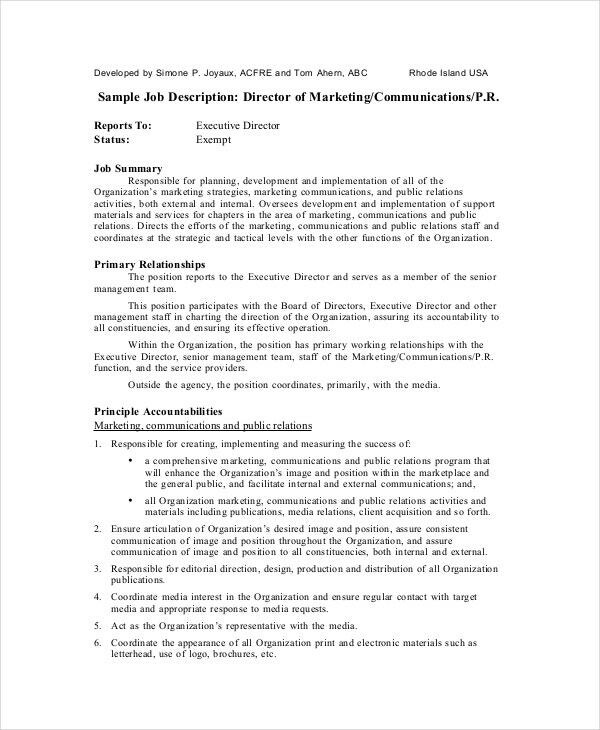 If you are looking for a job description template for marketing and public relation coordinator, this template will be a perfect choice for you. 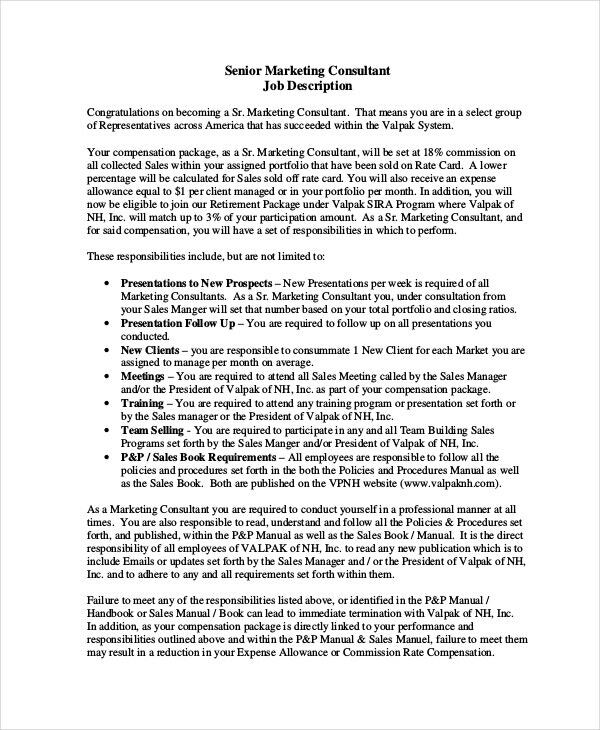 > What are the uses of these Marketing Job Description Samples? 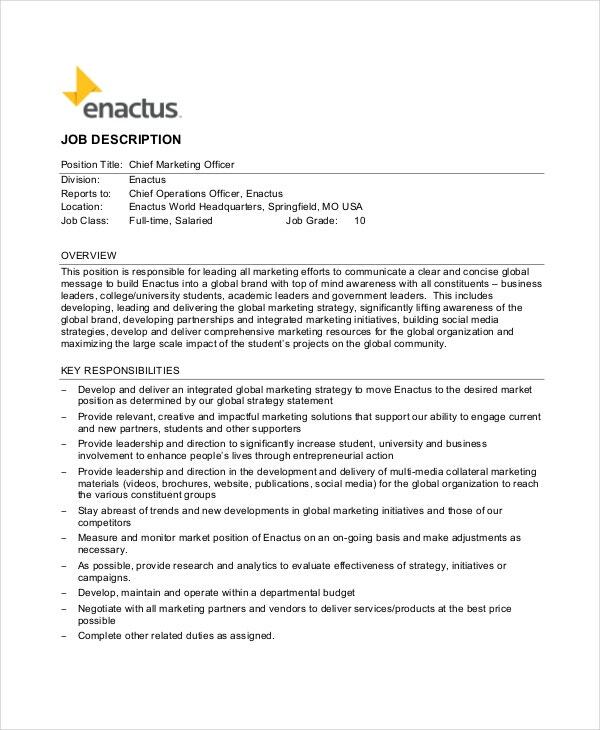 The market is teeming with qualified candidates for various marketing jobs, but due to lack of proper advertisements, companies have to deal with amateurs. 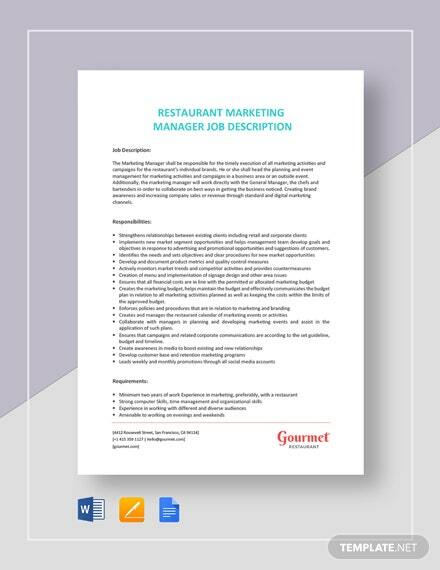 Businesses can use the Marketing Job Description templates as mentioned above to post jobs on the online platforms to get in touch with the talented candidates who may suit your requirement perfectly. 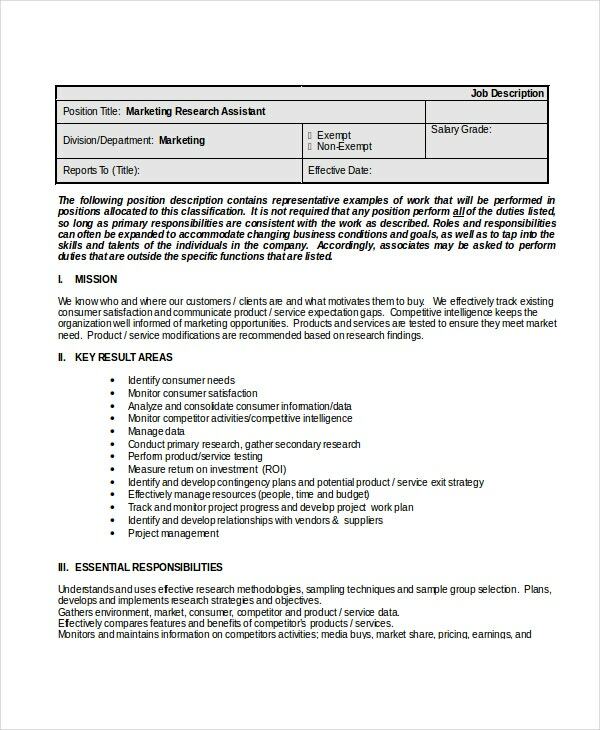 Through these marketing job descriptions, the applicants will get a clear idea about the job responsibilities, and these will help them assess themselves better before applying for the job. It will be beneficial for the both the employers as well as the applicants in equal measure. 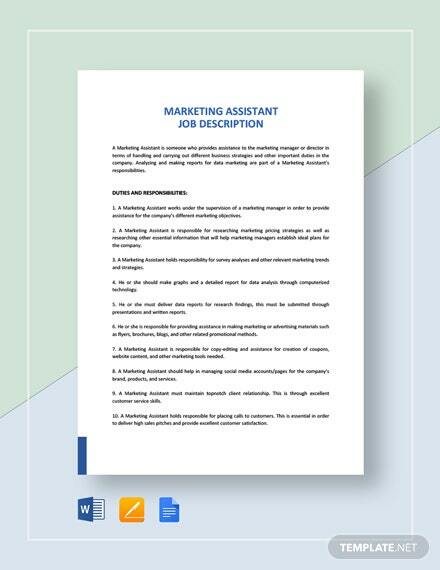 You can also check the Marketing Assistant Job Description templates. 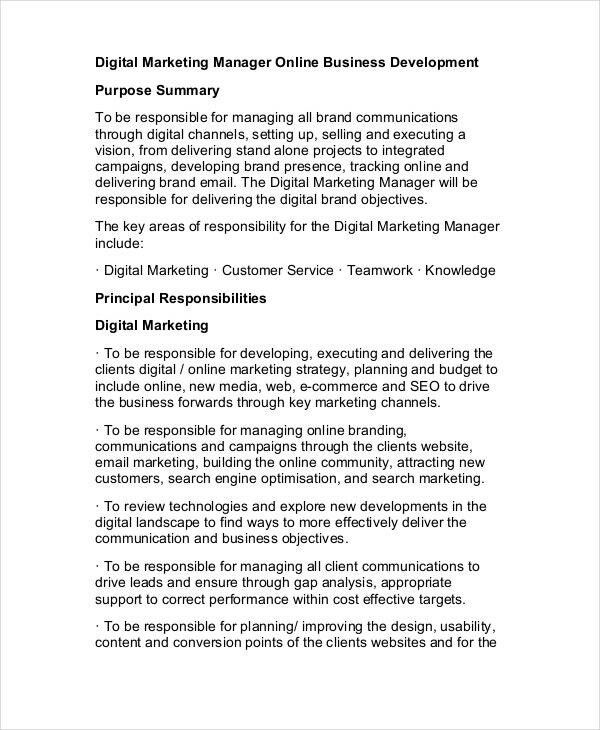 > Who can use these Marketing Job Description Samples? 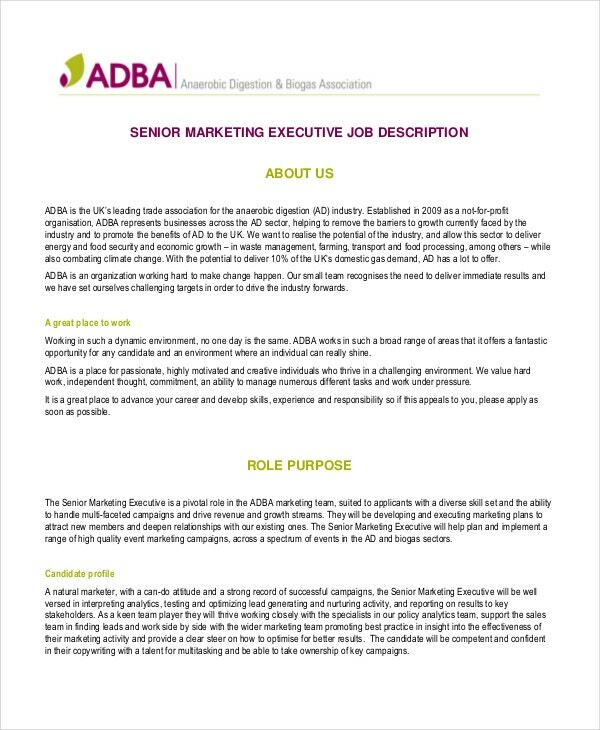 The Marketing Job Description Templates can be utilized by any and every organization that has a dedicated marketing team and wants talented candidates to join the team to make their marketing strategy and operations an effective and fruitful process. 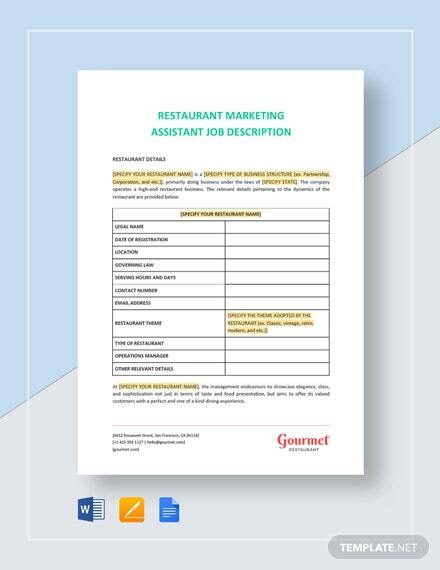 Even aspiring candidates who are either freshers or experienced professionals can take advantage of these templates to strike it big in the field of marketing. These templates will enable them to know about the various qualities and skills that they need to master if they want to create a niche for themselves as marketing professionals. 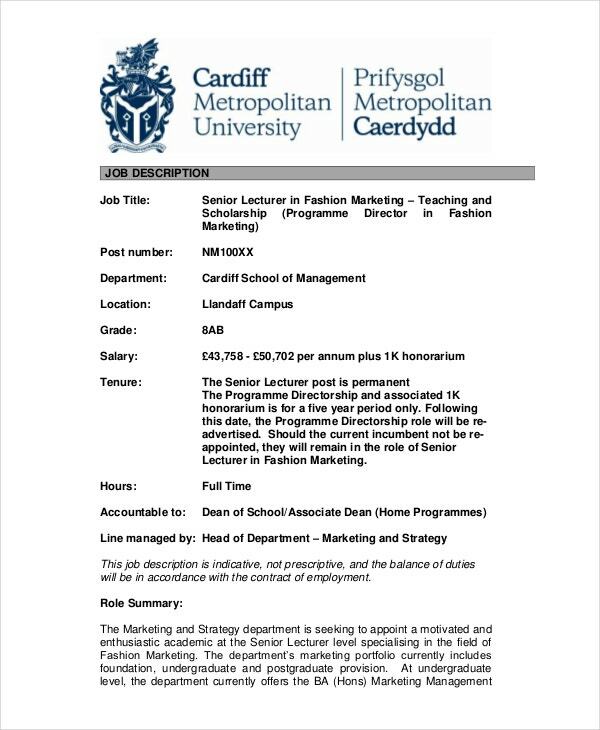 You can also see Marketing Assistant Job Descriptions. 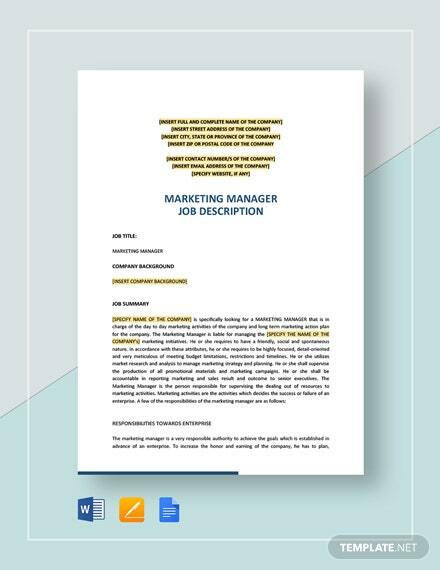 We have a vast collection of Marketing Job Description Templates in our kitty that will give you a good idea about how a proper marketing job description should be written. These templates are fully customizable. So you can download them and fill in the required information and use them to your advantage.